Of all the ethnic food from Latin America that I have experienced, I must say that Mexican cuisine is the one that mostly intrigues me for various reasons: one of them would be that they are one of the few cultures in the Americas – as far as I know – that not only adapted the dishes from their Spanish colonists but who were also able to preserve a lot of the culinary traits of the original communities that lived in the country before the conquistadores took over. Mexican food shares many common traits with the rest of Latin America – for instance, you always get rice and beans on the side of pretty much every dish you order, but they are distinguished by the use of hot peppers like poblano, jalapeno, Serrano and Habanero, the latter of which is one of the hottest in the world. Another trait is the commonly used tortilla, which is a flatbread made with either corn or flour that is also omnipresent at Mexican tables. When Renata and I visited Cancun in 2012, we had a great firsthand experience with the food of that country both in the restaurants that we visited and at the All-Inclusive resort we stayed in during the second half of our trip. However, we were no novices to their culinary as our Staten Island neighborhood is rich with Mexican-owned tiendas where they make tamales (steamed corn cakes filled with pork or chicken), tortas (basically very large sandwiches on hero-like bread), real tacos made with soft tortilla and other delicacies. Also, New York is home to many restaurants that serve Mexican fare, including Staten Island’s own Maizal, a more upscale eatery not far from where we live. Mexican food is rich to the palate and also challenging at times – where else can you have chocolate sauce served over your meat dish? 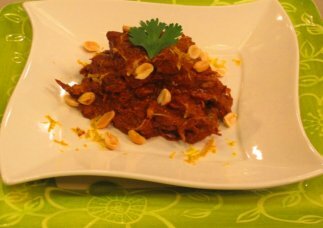 This unique combination, which is called mole, is surprising to the mouth because it subtly mixes the sweet tones of chocolate with peanuts, hot peppers, garlic and onions. We cannot get enough of it, and we often find ourselves guiltlessly betraying our Brazilian and Polish roots by preparing some of those delicious dishes at home. In a medium saucepan, sauté the onions and garlic in olive oil until the onions are translucent. Add, stirring constantly, the tomatoes, the chipotle in sauce, and the raisins until heated through. Let cool slightly and transfer the mixture into a blender, and add the peanut butter, the chicken broth, the chili powder and blend until pureed. Return to saucepan and cook, covered, for about 15 minutes. Add the chocolate and stir until melted. Add the chicken until heated through. Serve garnished with peanuts and orange peel with a side of rice, guacamole and beans.